This is late and early at the same time. 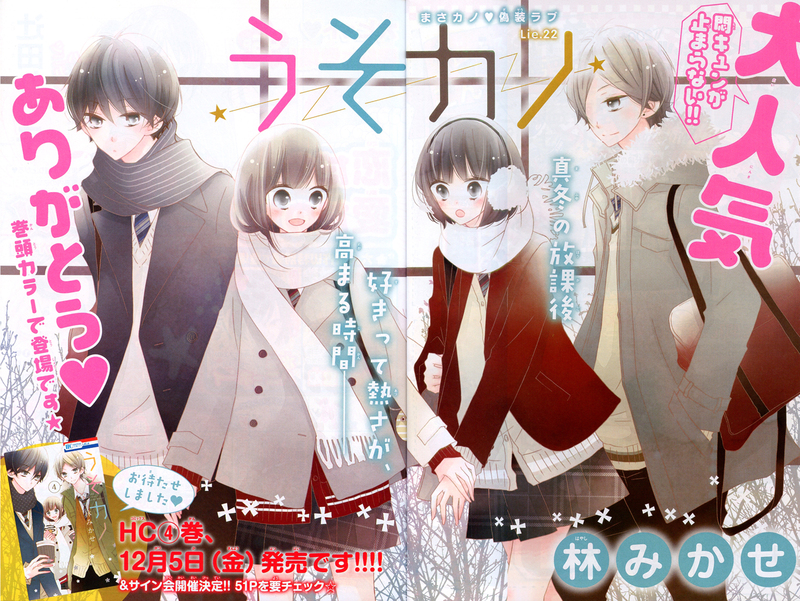 “Ookami Heika no Hanayome” is on the cover. 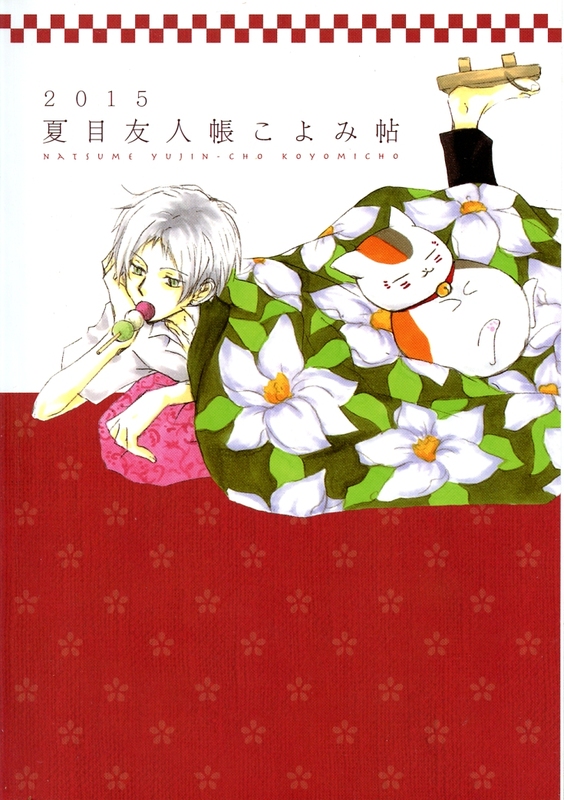 The furoku is a “Natsume Yuujincho” 2015 calendar and planner (which I am currently using.) The frontis page spread for “UsoKano” Lie 22. Here’s a preview page for Lala DX 1/2015. The furoku is a Nyanko-Sensei envelop. 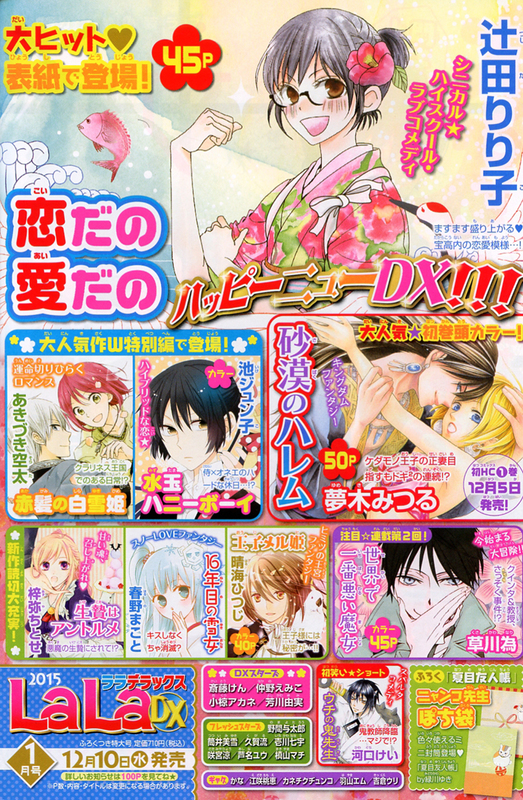 There will be a special chapter of “Akagami no Shirayukihime” and “Mizutama Honeyboy”. 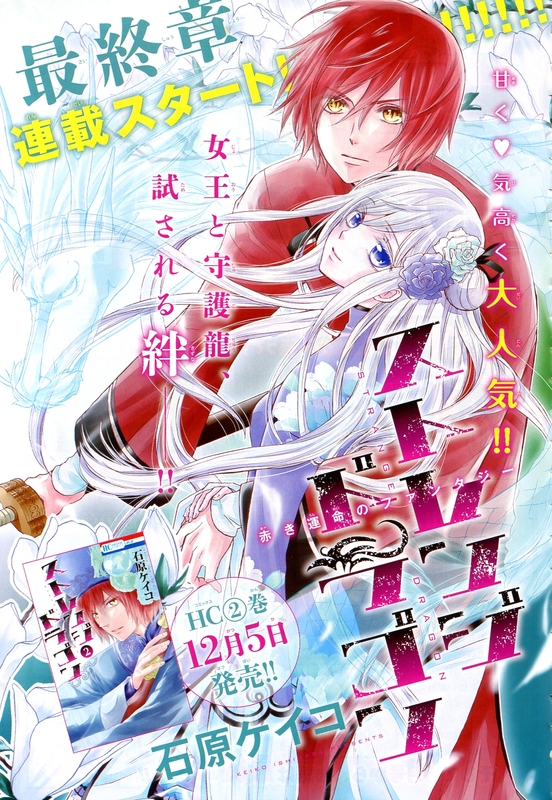 Sabaku no Harem’s new arc starts with long 50-page chapter. Needless to say, I’m super excited. Strange Dragon is entering it’s final arc… I think??? The frontis page is kinda confusing. It says “final chapter” and then right below it says “beginning of serialization”. But in another preview it says “heading toward the final chapter”. Either way, this series is gorgeous and I look forward to having the time to actually read it. I’m very happy to know the series is less than 5 volumes ^^. 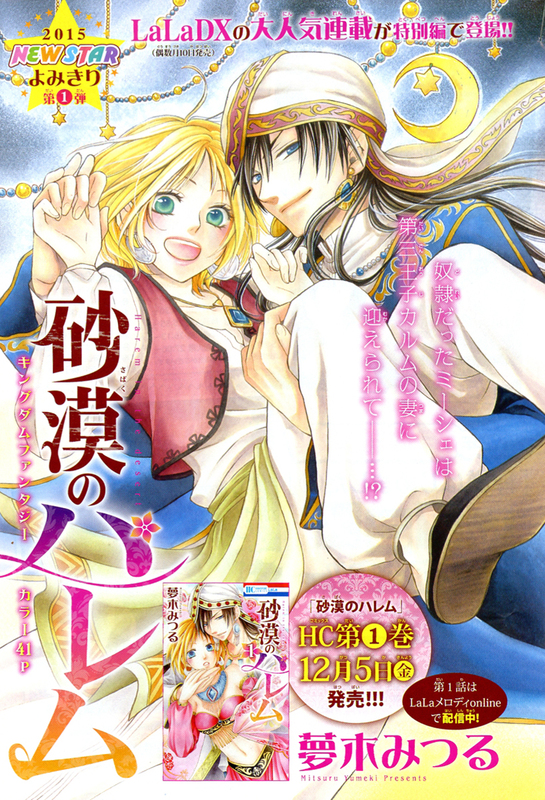 There is also an extra chapter of “Sabaku no Harem”. Yes! And lastly, here are the previews for Lala 2/2015. The furoku will be a Nyanko-Sensei drink bottle cozy. “Library Wars” will finally come to an end. I’m looking forward to a happy and romantic ending. 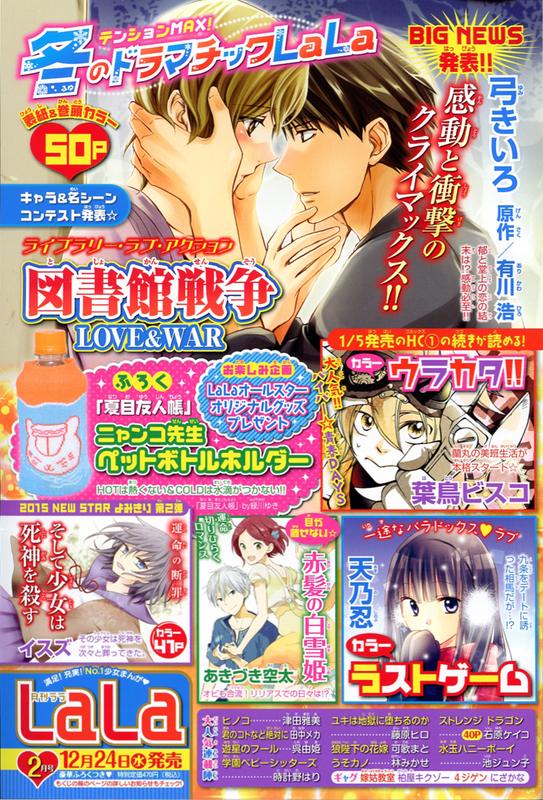 There will be a oneshot “Soshite Shoujo wa Shinigami wo Korosu” (“And the Girl Kills the Grim Reaper”). The preview reads, “This girl buried Shinigami one after another.” This oneshot is by Isuzu, the same mangaka who gave us “Mimi ga Kieta Hi” (“The Day Mimi Disappeared”.) Hmm… This could be interesting. Okami heika, you felt so much like a Saiunkoku (sp???) rip-off when I read you which is a shame since those are some cute designs. 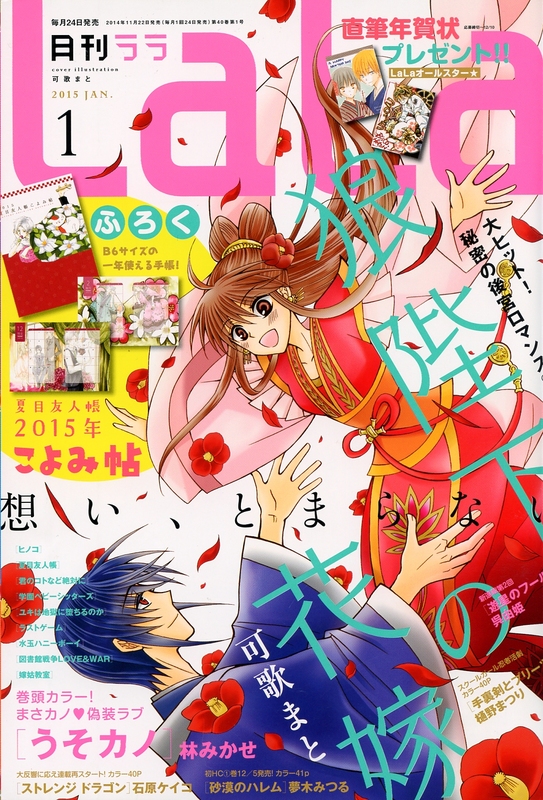 Hah, the heroine from Sabaku no Harem actually looks happy here! Looking forward to reading the first chapter of it after seeing you talk about it on twitter! I remember reading the first handful of chapters of “Ookami Heika”, and it didn’t grab my attention. It seemed very generic. Haha! More like 75% of the furoku are Nyako-Sensei items. It’s fine with me as long as the items are useful. I’ve used some of the keychains, notepads, coasters, and socks (the sock are really nice). I intend to use the drink bottle cozy. Sabaku is pretty light-hearted, although once in a while it smacks readers with some truth. I like the character growth so far and I think the humor is good. It’s a fun series to translate. I hope you enjoy it. I have translated 3 chapters so far.